For as long as they’ve been making films in Hollywood, those with power and money have been flocking to Santa Monica. Back in the 1920s, the beach north of the Santa Monica Pier was known as the Gold Coast because the people who built houses there were not merely rich, but celebrated too. Along this private road, Palisades Beach Road, lived four of the five men who created Hollywood; Irving Thalberg and his wife, actress Norma Shearer, oil man J. Paul Getty, comedian Harold Lloyd and leading man Douglas Fairbanks. Locals called the area Rolls Royce Row. 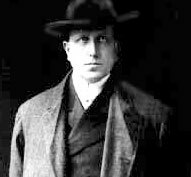 William Randolph Hearst might have been the first media mogul of the 20th Century. In his day, Hearst owned 28 major newspapers and 18 magazines, as well as radio stations and movie companies. Santa Monica’s Gold Coast was so desirable that in 1929, Hearst, one of the richest and most powerful men in America, commissioned Julia Morgan (the architect of the Hearst Castle) to fashion an estate on 4.91-acres of beachfront property for his mistress, actress Marion Davies. Morgan created a three-story, 34-bedroom Georgian mansion on the Pacific Coast Highway in Santa Monica. It was accompanied by three guest houses, two swimming pools, tennis courts and dog kennels. Called "Ocean House" or "The Beach House," it was the grandest property in the neighborhood. Rumor has it the cost was $7 million dollars. The property was sold in the 1940s to a private party, then the State took it over and leased it to the City of Santa Monica. The state leased it to the Sand and Sea hotel and beach club. But Randolph Hearst's 118 room, 55 bath mansion for Ms. Marion Davies didn't have enough bedrooms to make a go as a hotel. All but the pool, servants quarters and tennis courts was demolished in the late 1950s. The Sand & Sea closed down in 1991. The State took it over, and opened the road to the public. Previously, Palisades Beach Road was inaccessible to the general public because you could only enter that street through the Sand and Sea Club. The property stood idle while the State and City Council debated what to do with it. They leased the property for filming. "Beverly Hills 90210" used the club as its focal point in the hit TV series. Then the 1994 Northridge earthquake rattled the property to its foundation. All structures except the beach café have been red-tagged (designated as unsafe to occupy). It has since been fenced up and waiting. Members of City Council rallied for the structure, but still nothing happened. Then the City came up with an idea. 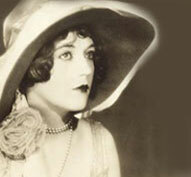 The estimated cost to rehab the Marion Davies was $18 million. Some months ago, the City staff came up with a new plan. As they weren’t willing to fund the $18 million rehabilitation project, they went in search of a private party. Thank you Wallis Annenberg, Walter Annenberg’s daughter, and advisor to the Annenberg Foundation, one of this country’s leading philanthropic organizations. She has expressed her intent to award a $21 million grant to the City of Santa Monica to help restore, renovate and reopen the former Marion Davies estate at 415 Pacific Coast Highway. Wallis is quoted in the Santa Monica Mirror as saying, "When I see a building and somebody tells me they're going to tear it down, and it has the potential to be reused, I get involved. What could be more spectacular than that space on the Pacific Coast Highway? What a great space for a beach park." The restoration will be a joint effort between the Annenberg Foundation, the City and the State, which owns the property. Council member Bobby Shriver, who chairs the State Parks Commission, is enthusiastic about the project, and the potential revenue streams in can bring the City and the State. 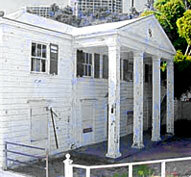 The rehab is expected to begin in the spring of 2006. 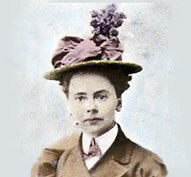 Julia Morgan was by far the most important female architect of the early twentieth century. Daughter of a prosperous Oakland mining engineer, Morgan was the first woman to graduate with a degree in engineering from the University of California at Berkeley, in 1894. With the encouragement of her teacher, Bernard Maybeck, she became the first woman to enter the revered Ecole des Beaux-Arts in Paris, in 1897, receiving her diploma in 1901. According to a KQED biography of her, before she was admitted, she stayed in Paris for several years until they could no longer admit she was not qualified. Women were not permitted to vote. From the moment she opened her own practice in 1905 until she retired in 1950, she was seldom without work, producing an estimated 1,000 buildings and consistently working 14-hour days. According to Bernard Maybeck, Morgan's one-time mentor, there was “never a job too large or too small for her.” Her repertoire included William Randolph Hearst's San Simeon castle, Fairmont Hotel in San Francisco as well as a college home for the son of Hearst's lawyer (McMurray). She came to adopt his philosophy that "houses should look as if they grew on the land." Ms. Morgan's philosophy was simple: design a structure that works well with its surroundings and pleases the client. 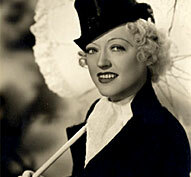 Marion Davies was born Marion Douras in Brooklyn, New York on January 3rd, 1897. She always wanted to be a star. When she met William Randolph Hearst, she had already made a name for herself on the Broadway stage. Rumor has it she wrote her first film, "Runaway Romany," directed by her brother-in-law, George Lederer. 1918’s "Cecilia of the Pink Roses" was her first film backed by Hearst. Then her marketing campaign began. Over the next ten years, Davies filmed an average of almost three films a year. She was a tireless worker, always trying to live up to the relentless promotional campaigns launched by Hearst. In the early twenties, she and Hearst relocated their movie company, Cosmopolitan Productions, to California to join forces with Metro-Goldwyn-Mayer studios. Once the Beach House was finished, Marion evolved into Hollywood's premiere hostess. Her parties attracted the day’s biggest stars, international dignitaries and business titans. Those who knew Davies say she never took herself seriously and was beloved by all who knew her for her gracious spirit and charitable tendencies. For as long as they’ve been making films in Hollywood, those with power and money have been living in Santa Monica. Back in the 1920s, the beach north of the Santa Monica Pier was known as the Gold Coast. Beach Road, a.k.a. Palisades Beach Road, was called the Gold Coast because the people who built houses there were not merely rich, but they were celebrated too. In the early days, Beach road was home to four of the five men who created Hollywood; Irving Thalberg and his wife, actress Norma Shearer; oil man J. Paul Getty; comedian Harold Lloyd and leading man Douglas Fairbanks and his wife Mary Pickford. Locals called the area Rolls Royce Row. In 1928, the Gold Coast was so desirable that newspaper magnate William Randolph Hearst, one of the richest and most powerful men in the world, commissioned Julia Morgan (the architect of the Hearst Castle) to fashion an estate on the beach for his mistress, actress Marion Davies. Morgan created a three-story, 118-room, 34-bedroom, 55-bath Georgian mansion on the Pacific Coast Highway in Santa Monica. It was accompanied by three guesthouses, two swimming pools, tennis courts and dog kennels. Called "Ocean House" or "The Beach House," it was built at the astronomical 1928 cost of $7 million dollars. It was the grandest property in the neighborhood. The road under the bluffs has always been one of the most desirable streets in town. Hollywood legend Harold Lloyd was at 443 Beach Road, Mae West at 514, Darryl Zanuck at 546, Samuel Goldwyn at 602, Harry Warner at 605/607, Louis B. Mayer and Peter Lawford at 625, Douglas Fairbanks and Mary Pickford at 705 and Norma Shearer at 707. How about some early Kennedy stories…When America’s royal family migrated west from compound in Kennebunkport, Maine, they settled at 625 Beach Road, the former home of movie mogul Louis B Mayer. Pat Kennedy, sister to President John F. Kennedy, and her bonvivant husband Peter Lawford. When President Kennedy visited L.A, he officially staying at the Beverly Hilton, but he spent a lot of time relaxing by Santa Monica beach. Lawford – who was engaged in swinging ‘60s Hollywood lifestyle - would entertain the president with starlets, models and hookers. His parties for the President were attended by beautiful people like the Rat pack and Marilyn Monroe. It’s rumored that when in L.A., J.F.K. rendezvoused with Marilyn Monroe at 625 Beach Road. The President spent so much time here; in the ‘60s the Gold Coast became known as the Western Branch of the White House. Until 1991, Palisades Beach Road was inaccessible to the public. You could only enter that street through the exclusive private beach club, The Sand & Sea Club. 1991 was the year the Sand & Sea closed down. The state took it over, opened Palisades Beach Road, and leased out the property for filming. Many episodes of the popular TV series "Beverly Hills 90210" featured scenes from the Sand and Sea estate. That’s the story of one street. Celebrities live all over Santa Monica, not just on the Gold Coast. Well-known residents have included actors Sean Penn, June Lockhart, Tobey Maguire, Robert Redford, Jeff Bridges, Jamie Lee Curtis, Ted Danson, Judge Reinhold, Harry Shearer and Tom Selleck. We could give you their addresses, but we won’t. We will tell you that the honorable Governator Arnold Schwarzenegger lived on 21st St. before he married Maria Shriver, and that he currently own 3110 Main Street – the commercial complex with the restaurant Schatzi, and a mural the Terminator by the elevator. In 1978, Santa Monica’s the city's best-known political activists were actress Jane Fonda, whose vocal opposition to the Vietnamese war still irked conservatives, and her husband, Tom Hayden, a founder of Students for a Democratic Society in the early '60s and one of the Chicago Seven who were tried on and acquitted for disrupting the 1968 Democratic Convention. This grassroots group that organized residents, backed candidates for local offices, and was instrumental in our rent control laws. In 1982, Hayden was elected to the California State Legislature, and the celebrity couple moved out of Santa Monica. And now the Kennedys are in vogue on the Santa Monica political landscape. City Council Bobby Shriver is the nephew of former President John F. Kennedy, the son of 1972 vice presidential nominee R. Sergeant Shriver and Special Olympics founder Eunice Kennedy Shriver, and brother California first lady, Maria Shriver. Shriver, a Yale-educated lawyer and longtime philanthropist, decided to run for City Council after he and some of his north of Montana Ave. neighbors received citations related to a 1948 ordinance governing hedge and fence height. The City demanded that Shriver trim the hedges around his home or face misdemeanor charges. Angered by the arbitrary way in which the City conducts itself, he chose to run for City Council. He received the most votes in the November City Council Election. "Landslide Bob, that's my nickname," laughs Shriver, 50, who heads an AIDS foundation called DATA. “I never believe that people vote based on money or name," he stated. "When people say, 'You got my vote,' they're ... not saying that because you've got a nice smile or because you come from a famous family. Voting is an intimate act." Thank you to all the high-profile people who make Santa Monica such an entertaining place to live. Next week…TV and movie locations around town. For your real estate needs, e-mail Jodi Summers at jodis@boardwalkrealty.com, or call (310) 309-4219.